Ideally suited for low frequency portable applications to 400 kHz Bandwidths. The PCI-8 “AE System on a Board” is an 8-channel, Digital Signal Processing (DSP) AE data acquisition system, based on a cost-effective single, full-size, PCI card. Through the high performance PCI bus, significant AE data transfer speeds (up to 132 MegaBytes/second) can be attained, assuring a wide bandwidth bus for multi-channel AE data acquisition and waveform transfer. The 32-bit PCI bus has become the de-facto standard in all PC computers being shipped today. Therefore, PCI-8 AE Subsystem boards can be implemented inside most standard PC computers or inside one of PAC’s four, rugged, multi-channel PAC-SAMOS™ system chassis, that of SAMOS™ 32, SAMOS™ 48, SAMOS™ 64 and 24-Channel μSAMOS™ chassis. Due to advances in surface mount technology and high density ASIC (high density Programmable Gate Arrays) devices, PAC has been able to provide this single AE System on a Board with 8 complete high-speed AE channels of features acquisition, waveform processing and transfer, 2 analog parametric input channels and 8 digital input and output control signals. 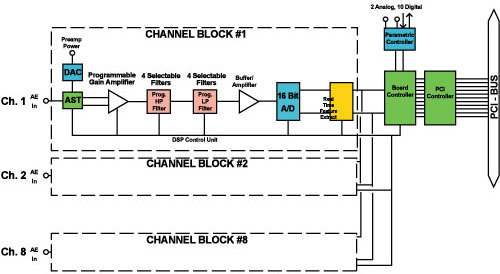 8 digital (16-bit A/D) complete channels of AE features and waveforms on a single PCI card. PCI-bus provides AE data transfer rates of up to 132 Mbytes/sec to a PC computer. 4 High Pass, 4 Low Pass filter selections for each channel, totally under software control. 8-parallel processing 3MS/sec, 16-bit A/Ds. Up to 2 parametrics on each PCI-8 board with update rates up to 10,000 readings/second (when attached to hit data). Designed with multiple FPGA’s and ASIC IC’s to provide extreme high performance and minimize components and cost. Hit LED drivers are built within the PCI-8 board, so that AE activity LED’s can be attached directly. Built-in AE feature extraction provides high speed transient data analysis at high hit rates. Uses standard SMB connectors for ergonomic connections. Low Power consumption and 1 - 400 kHz bandwidth. Built-in waveform processing and DMA & Bus Mastering transfer for high-speed transfer of waveforms on all 8 AE channels needed for advanced AE. A simplified block diagram of the PCI-8 board is shown below. The input signal coming directly from the PAC preamplifiers (or the PAC integral preamplifier sensors) is routed to each of the PCI-8 channel inputs. These are SMB connectors located on the rear PC metal hold-down bracket of the board. Phantom power for powering the preamps is available on the center conductor of the AE input coaxial connector, as is PAC’s standard unique AST (automated sensor test) which provides computer controlled pulsing of each active AE channel for determination of sensor coupling efficiency and system verification. Also featured on the preamplifier power supply is a D/A converter (DAC) preamp power voltage control. This voltage controls a special 1222LF preamp, which has built in voltage controlled gain and test signal. Therefore, by varying the DAC, the preamplifier can be software controlled to change its gain or conduct a self-test. The incoming AE signal is then conditioned and passed to the selectable filter circuitry, where one of 4 High Pass filters and one of 4 Low Pass filters is applied in accordance with the user software-programmed filter strategy. The filtered signal then is passed to the 16-bit A/D converter module, where the AE signal is digitized at rates up to 3.0 MSPS. The 16-bit digital AE output is then passed to the feature extraction circuitry (which converts the signal into AE hits and features instantaneously). The high speed feature extracted data is transferred to the computer for further processing through the PCI bus. Also, waveforms are simultaneously processed and transferred to the computer using high-speed DMA access directly to the computer for collection, further processing and storage. Audio drives ready for “high fidelity” listening with your PAC PCI-Audio Card. Award winning PACwin Suite Software with 25 years of acoustic emission application experience behind them. 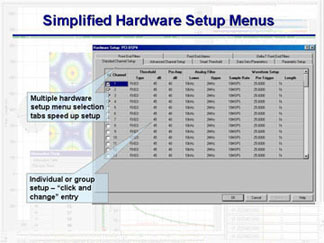 Suite includes AEwin™ real time Windows 2000 or XP acquisition, replay and analysis software, AEwinPost™ Post analysis software and NOESIS™, the most complete Pattern Recognition (supervised or unsupervised) and Neural Networks software in the AE and NDT market today (ask us for our free drives to reading competitive system data files. . .so that their AE data can make sense). Auto Sensor testing standard with all PAC systems for easy system/sensor self calibration and interface coupling efficiency. PCI-8 is supported by PAC Windows Platform of PACwin™ Suite. 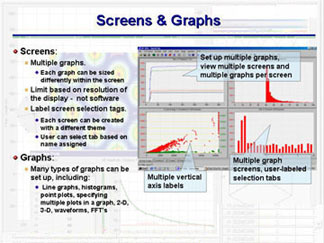 All software runs in Windows 98, Millennium, 2000 and XP, thus taking advantage of standard features as multi-tasking,graphic user interfaces, etc. and providing the ability to change AE parameters during test operation. 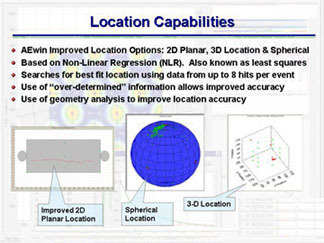 Multiple location algorithms are available including linear, Tank bottom planar, cylindrical, spherical (with ASME weldzones), 3-D, advanced Non-Linear Regression (NLR) location, over-determined planar location for exceptional accuracy. All location algorithms include amplitude correction tables/curves for auto-sensor placement, more accurate location and AE intensity calculation. Due to advances in surface mount technology and high density ASIC (high density Programmable Gate Arrays) devices, PAC has been able to provide this single AE System on a board with 2 complete high speed, AE channels of real time AE data acquisition, with real time feature extraction, waveform processing and transfer, 2 analog parametric input channels and 8 digital input and output control signals.